You’ve decided it’s time to start an online business (or level up an existing business). CONGRATULATIONS! This is such an exciting time for you! If you’re anything like me, you’re probably madly researching, trying to figure out exactly what tools you need to use to get your business off the ground. In this day and age, one of the most important parts of your business is your website. Over the last 9 years, I’ve built more websites than I care to remember, and I’m sharing some of my favourite tools. This list will help make sure that you start your business on the right foot! 9 years ago I was busy starting my first business. I was pregnant with my first child, and I was excited and overwhelmed all at the same time. There was so much to do, so much to learn, and as a soon to be stay-at-home-mother in a single-income family, money was SUPER tight. I couldn’t outsource ANYTHING, so I had to learn almost EVERYTHING. Now, my husband is a software developer, so I thought that I could at least offload my website on to him. I gave him a rough idea what I needed and left him to build it. While I was (and am) incredibly grateful to him for the work he put into designing and building me a website, the end result was not what I needed. Sure, it looked pretty, but there were a few BIG problems. It was not designed to convert site visitors into customers. The navigation was confusing, there were no real calls to action, and the site was just not a compelling sales tool. It was super technical. Because my husband is a super-technical guy, he built me a website using his super-technical skill set. This sounds good in theory, but in practice, it was a disaster. I couldn’t change or update ANYTHING without his help. 6 months after he built me my first business website, I was fed up and frustrated. I began researching user-friendly but feature rich Content Management Systems (CMS), and 12 months after the ill-fated first website launched, we transitioned my site to WordPress. In the 8 years since then, I have been planning, designing, building and managing my own websites, and for the last 2 years, client websites. I will offer a disclaimer, that because we collectively have a LOT of sites, my super-technical husband still manages the enterprise-level hosting for most of the sites we own. The struggle of trying to bootstrap a small business is something I remember well. If I can share my knowledge, and help other entrepreneurs and small business owners make the right decision for their business, I’m going to share that knowledge. With that in mind, I’m sharing a list of the essential resources I use when building a website, be it for myself or someone else. Products and services marked with an asterisk are affiliate links. If you choose to purchase through these links, I receive a small commission at no extra cost to you. WordPress.org (not to be confused with WordPress.com!) is a well-established, incredibly sophisticated, and remarkably user friendly piece of software. While originally designed for blogging, it has expanded to do so much more. It is estimated that 25% of the internet is built on WordPress. Core WordPress functionality has a very gentle, easy learning curve, however the more you use it, the more you realise you can do with it. The software itself is 100% free and open source, however to use WordPress.org, you will need to purchase a domain name and web hosting (this is your website address and a place on the internet to build your website). Over the years, my husband and I have gone through quite a few web hosts, and we’ve almost always run with classic enterprise hosting companies like Rackspace and Amazon Web Services. Around 6 months ago, we decided to try something new, and moved to SiteGround. We’ve been so incredibly happy with them, that I can’t see us changing web hosts again in the future, unless something drastically changes. Their uptime is absolutely brilliant (seriously, our sites NEVER seem to go down), they’re FAST, which means our sites are fast (incredibly important for an effective website. People just will not stick around waiting for a page to load), their customer service is quick, friendly and genuinely helpful, and they are very affordable. When I’m talking about Elegant Themes, I’m really talking about Divi. It’s their signature theme, and is arguably the most popular WordPress theme currently on the market. It’s extremely powerful, with almost unlimited options. The front-end editor makes it simple for even the most non-technical person to use. Creative Market is an online marketplace, offering themes, stock photography, fonts, templates and graphic design tools. Before purchasing a theme from Creative Market, make sure you check the comments. It’s a good place to look for feminine WordPress themes that are not overly complicated, and work “out of the box”. Don’t expect these themes to be infinitely customisable. Before you make a purchase, make sure that the demo theme does everything you want your website to do, and is laid out the way you want your website to look. If you’re looking for a feminine WordPress theme that doesn’t require much setup to look great, have a look at the themes available from BluChic. Themeforest is an online marketplace for website themes, and like most online marketplaces, the quality of the products vary greatly. If you choose to go with a theme from Themeforest, make sure you check the reviews and comments. I will also note that most of the popular themes on Themeforest have a very steep learning curve, so be prepared to spend a lot of time learning and customising your theme. Avada* is a very powerful theme with great functionality and a steep learning curve. You can expect to commit a significant amount of time to learning how to use the theme, however there is excellent documentation to support you. Sahifa* is a very busy newspaper style theme. It’s a powerful theme, but I was disappointed in the quality of the documentation. Stockholm* is an extremely powerful multi-purpose theme. The documentation was ok, and I love the look of this theme. Unfortunately the back end became “buggy” over time. WPLMS* – Not my favourite Learning Management System for WordPress. I prefer to use a LMS plugin, separate to my theme, when self-hosting e-Courses. If you’re looking to self-host an e-Course, I recommend LearnDash (it’s a powerful plugin, not a theme). Simplemag* is possibly my favourite theme from Themeforest, although it will not suit every business. It’s a beautiful, very customisable theme, well suited to blogs. It’s well documented and easy to use. KidsCare* is a very specific theme for baby and child centred businesses. It worked very well for my client. I worked straight from a built-in template, so I can’t comment fully comment on the documentation or learning curve. TownPress* is a very specific theme for a local council website. It’s easy to use out of the box, if all you want is the core functionality of the demo site. Hemlock* is a basic blogging theme. It’s very pretty but not very flexible. Porcelain* is a very powerful theme with great functionality and a steep learning curve. You can expect to commit a significant amount of time to learning how to use the theme, however there is excellent documentation to support you. I am a dedicated user of gSuite for Business, Google’s range of business tools. It’s a simple way to have a professional email account (because I cringe every time I receive an email from “yourbusinessname@gmail.com”). If you have more than one person in the organisation, these tools are all collaborative, meaning you can create knowledge repositories, shared documents, shared calendars and more. As the administrator of your gSuite account, you can also restrict external access to these tools, making them unable to be shared outside the organisation. Depending on where you live, it’s usually around $5 per user per month (I’m in Europe and I pay €4 per user per month). Email marketing is a very powerful tool, and one that almost every business can benefit from. Depending on your email marketing strategy, I have 2 recommendations for new businesses. If you have not yet planned your email marketing strategy, Mailchimp is an excellent tool to use. It’s core functionality is free for up to 2000 email subscribers and it’s very easy to setup and use. Plus it integrates with just about everything. If you want to use any of the advanced Mailchimp features like A/B testing, or automations, you will need to pay for these, no matter few few subscribers you have. MailerLite is ideal for you if email is a big part of your business strategy, or if you plan to use automation. It is 100% free, including all the advanced functionality, for up to 1000 email subscribers. This means you can use it, at no initial cost, to set up sophisticated email sequences and email marketing funnels. It has fewer integrations available than some of the larger, more well known services, although this rarely causes a problem. If your business is online, chances are, you’ll need to create branded graphics and other images on a regular basis. While you can obviously purchase an Adobe Creative Cloud membership (and use Photoshop, and Illustrator), there are some significantly simpler and cheaper options available. PicMonkey is an online photo editing suite that is both simple and intuitive to use. They have recently released a limited range of templates you can use to create your online and offline graphics (including website headers, facebook cover images, pinterest infographics and more), as well as edit your photos. There is a free tier, however you have more advanced photo editing and template options available to you if you upgrade to their paid plan. PicMonkey is an excellent choice if you take a lot of photos you need to edit, and you may also need to create the occasional graphic. Canva is an online graphic design suite that is also simple and intuitive to use. They offer a MUCH larger range of templates you can use to meet ALL your online and offline graphic design needs. There is extremely limited photo editing functionality, and only as an element of a graphic you are creating. Canva has a free tier, with the option to pay for premium elements (like stock photos and graphics) at a cost of $1.00 per element. The paid option, Canva for Business, offers integrated branding support, the ability to work as a team, and greater flexibility in your graphic design. Canva is an excellent choice if you require regular graphics for your website and social media accounts. I use Canva and PicMonkey together, and find they complement each other very well. 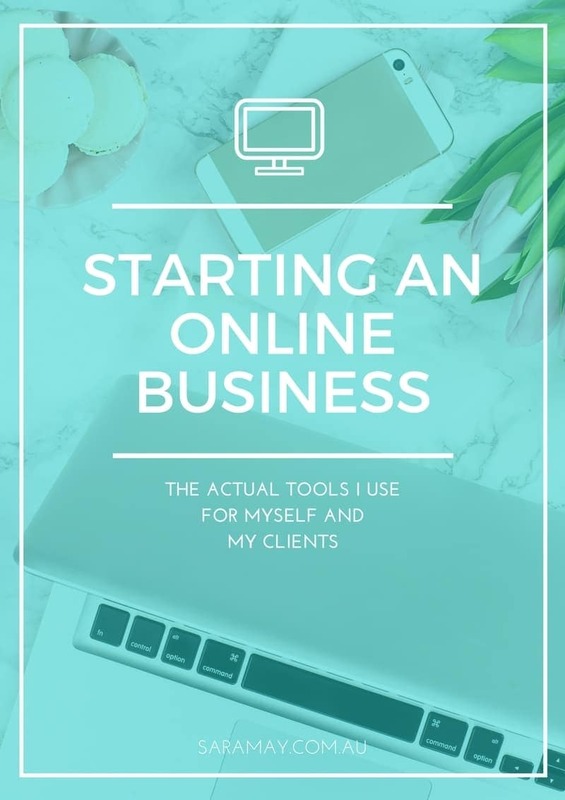 Whether you’re taking your business online, or starting an online business from scratch, I hope you’ve found this list helpful. Have I missed anything? Is there a tool you’re currently considering that didn’t make it onto the list? If so, let me know in the comments, and I’ll gladly share my thoughts.